Fall Schedule is now up!! 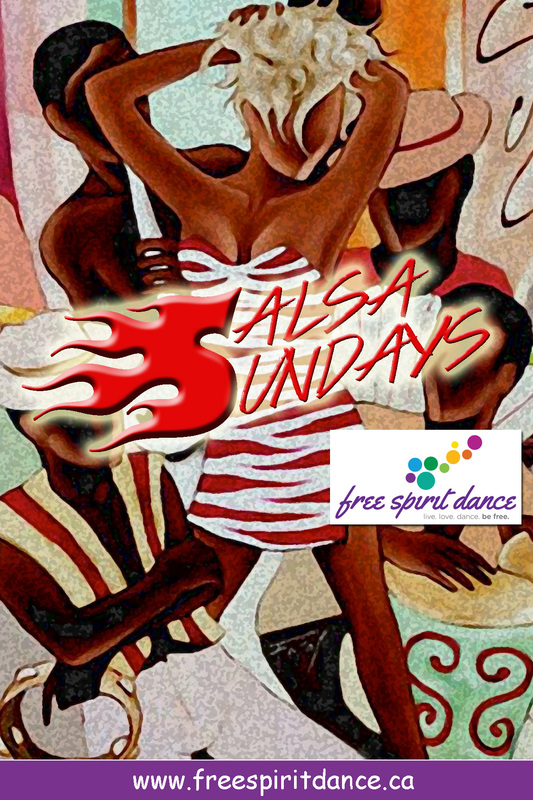 Free Spirit Dance’s Salsa School in Calgary offers a variety of Latin classes, flexible schedule and even performance opportunities. Join our community! FUN. FITNESS. DANCE. Salsa Footwork Series: This class is for students wanting to learn salsa footwork and shines to show off on the dance floor. Have you ever wondered what to do when your partner suddenly lets go of your hands in the middle of a song? In this series you will learn footwork, including tips and tricks of the trade when you are left to groove it out on your own on the dance floor! Here’s your chance to learn amazing footwork to apply in those very instances. Come take the footwork challenge and let’s dance! Drop-ins welcome. Bachata Footwork Series: In this series you will learn bachata urbana footwork, including tips and tricks of the trade when you are left to groove it out on your own on the dance floor! Bachata Urbana (Urban Bachata) is a fast-paced Bachata with an urban flavor. This style of Bachata is danced in all directions (not just side-to-side) and integrates new elements of sharp musicality, turn patterns and urban attitude. Come take the footwork challenge and let’s dance! This is for the experienced beginner – intermediate. Drop-ins welcome. Reggaeton Fusion – Open: For the beginner-intermediate. This class is guaranteed to make those hips shake. Do you love Latin culture and want to learn how to booty shake? This class uses reggaeton music and movements combined with different dance styles such as salsa, merengue, hip hop, jazz funk and more. Expect to laugh, sweat and shake those hips! Drop-ins welcome. Cuban Salsa Level 1 – Absolute Beginner: This foundations class will introduce you to this infectious street dance born in Cuba known for it’s unique circular movement. Cuban Salsa has strong influences from Cuban Son, Danzon, Afro-Cuban folkloric dancing and Mambo. You will learn all the basic steps to get started on the dance floor in a Latin club or on your next trip to Cuba. No partner required. No drop-ins allowed as each class builds on the next. Casino Rueda Level 1 – Beginner: Rueda means wheel in English. Rueda de casino is a danced in a circle (wheel) where multiple pairs of dancers exchange partners in a circle. There is a “caller” who signals to the rest of the group what move comes next. This class focuses on understanding the Rueda circle, common moves in Casino Rueda and timing. No partner required. No drop-ins allowed as each class builds on the next. Prerequisite: You must have taken Cuban Salsa Level 1 or have taken Cuban salsa lessons elsewhere where you are comfortable with the basics. Salsa/Bachata Level 1 – Absolute Beginner: No previous Latin dance experience required. You will learn all the fundamental salsa basics necessary to get started on the dance floor in a Latin club or on a tropical destination. This class includes an introduction to bachata. No partner required. No drop-ins allowed as each class builds on the next. Salsa Level 1.5 – Experienced Beginner (Salsa on 1): This class will be a continuation of Level 1 and will help you transition into an intermediate class. The class will develop further the lead and follow technique using more challenging patterns, including rhythm, timing and foundations in balance and spin technique. No partner required. No drop-ins allowed as each class builds on the next. Prerequisite: You must have taken Level 1 or you are an experience beginner who has taken classes elsewhere where you are comfortable with the timing and right hand turns. Salsa Level 2 – Intermediate (Salsa on 1): This class continues to build on the previous two levels focusing on partnering techniques, body movement, rhythm, timing, musicality, footwork and multiple turns. Take your salsa to the next level! No partner required. No drop-ins allowed as each class builds on the next. Prerequisite: You must have taken Level 1 and 1.5 or you are comfortable with cross-body lead, timing, turns and timing. Student Performance Groups: Have you caught the salsa bug and want to take your salsa to the next level? Click here for more information on how you can join our teams.